We know you've all been nice this year, but just in case, we wanted to remind you that December 5 is Krampus Night (or Krampusnacht): the night when that half-goat, half-demon spirit of Christmas chaos appears to basically be the antithesis of Saint Nicholas. He thieves, he gives out coal, and as these vintage cards indicate, generally torments all the naughty boys and girls (and men and women!) who aren't in Santa's good graces. Get familiar with the hairy, horned, serpentine-tongued beast—that way you'll be able to see him coming. This terrifying composition is both ridiculous—and a little too realistic for our liking. This town seems to have a lot of naughty kids. Even an evil demon beast cowers when in the presence of Old St. Nick. It might seem weird for these two to look so chummy, but they've actually been palling around since the 17th century. Or maybe the patron saint of sailors, voyagers, merchants, repentant thieves, children, brewers, judges, perfumers, pawnbrokers, students and more, is just cheesing before ditching the Christmas devil. Not all paramours are what they seem. That's one way to manage your fears. 9. "GABEN DEN GUTEN! DEN SCHLIMMEN DIE RUTEN!" The good kids get gifts from Santa and the bad ones get the Krampus's rod, but both Christmas figures offer greetings, so there's that! 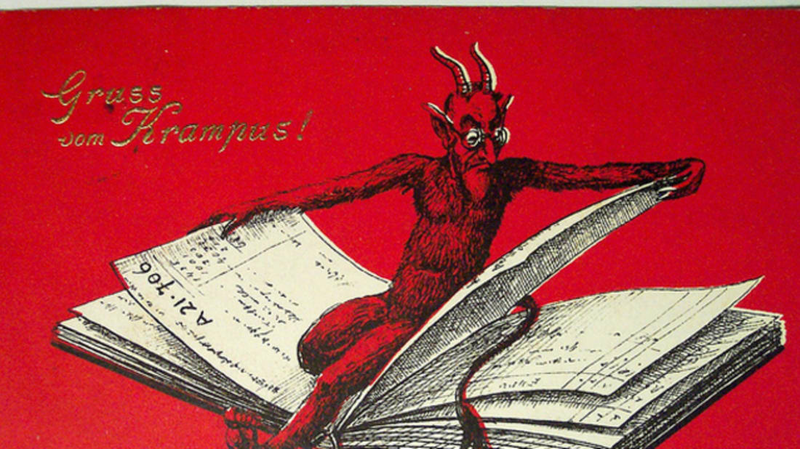 Poor Krampus is looking worse for wear in this holiday card. Perhaps he's had a long night of seasonal menace-making. In this cheery depiction, a female Krampus "beckons with eternal chains," and looks pretty while doing it. That basket ride would be pretty fun were it not for the mythical and punishing Christmas demon. Even we can admit: this looks pretty cool. Always put your best hoof forward when descending to hell with a crew of dubious, cherub-cheeked children. There's been an uptick in the production of Krampus figurines in recent years, so it might be high time for you to get your own. We just hope it doesn't become part of a toy attack like in Krampus (2015). Is he hiding behind the fan? Is she using the fan to push him away? Either way, it might be a good idea to arm yourself with the fashionable ventilator this holiday season. It's unclear exactly what's happening here, but Krampus has his spectacles on, so you know it's serious.